15 years on from her first appearance, she’s back, but slightly younger than in her last outing! 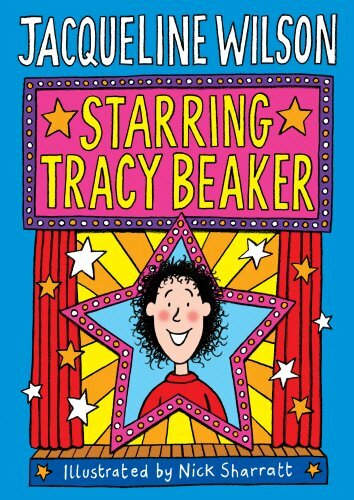 The Children’s Laureate brings her Children’s Home heroine, Tracy Beaker, back for a third time. Interestingly, this third book is the second story chronologically, sandwiched between The Story of Tracy Beaker and The Dare Game. Starring Tracy Beaker sees Tracy desperate to land the lead role of Scrooge in the school production of A Christmas Carol. She succeeds but is then banned from the part, for a while at least, after getting into a fight. In this typical Wilson rollercoaster ride of hilarity and heartbreak, we see Tracy desperate for her mother to manage to come over from Hollywood to see Tracy in her starring role. Needless to say, Tracy is let down once again by her mum. Meanwhile foster mother, Cam, does her best to raise Tracy’s self esteem. Nick Sharratt (who else!) provides the ever popular illustrations. The first chapter of The Dare Game is cunningly included as a post script to this sequel to the original Beaker story. This will be another ‘must read’ for all Jacqueline Wilson fans.